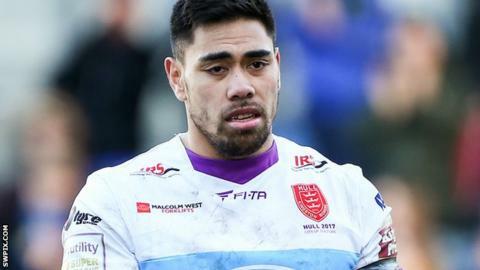 Ken Sio's late try stunned 19-times Challenge Cup winners Wigan as Hull KR caused an upset to make the last eight. It was 6-6 at the break at Leigh Sports Village after the visitors led thanks to Maurice Blair's try. The Warriors responded through Joel Tomkins's try. After Josh Mantellato and Matty Smith exchanged penalties, Wigan's Joe Burgess crossed in the corner. But the visitors effectively won it on 73 minutes when Dan Sarginson knocked on and Sio gathered to touch down. The tie was played at Leigh Sports Village as the DW Stadium pitch was having work done following the conclusion of Wigan Athletic's season. The quarter-finals are scheduled to take place on the final weekend of June. The game was in complete contrast to the previous meeting between the two sides a fortnight ago at the DW Stadium when Wigan ran in 11 tries in a 60-0 Super League win against the Robins. Despite the hosts dominating the early territory, Blair scored the first try of the game when he powered through a number of tackles. In slippy conditions, both sides made a number of handling errors, but Tomkins caught a George Williams' pass to touch down from close range. A Mantellato penalty put Hull KR back in front again, but Burgess did well to finish out wide to give Wigan the advantage once more. With the Warriors looking to run the ball from deep, England centre Sarginson then dropped the ball close to his own line and Australian centre Sio showed his strength to wriggle over the try line. "The referee didn't control it at all and it gave them a massive advantage. "They were the better team. They came with a game plan and it worked. "We were just a bit dumb, giving penalties away and not really committing to our plays." "We were obviously humiliated last time - we put that down to a blip and spoke about how it can never happen again. "I'm really proud of the effort, desire and commitment. At times we were under the pump but we found a way to get to the other end and win. "It's a special victory, a lot of people had written us off but my guys thrive on that." Wigan: Hampshire; Charnley, J Tomkins, Sarginson, Burgess; Williams, Smith; Crosby, McIlorum, Mossop, Farrell, Bateman, O'Loughlin. Replacements: Tautai, Powell, Patrick, Sutton. Hull KR: Cockayne; Mantello, Welham, Sio, Dixon; Blair, Campese; Green, Boudebza, Tilse, Larroyer, Horne, McCarthy. Replacements: Ollett, Cox, Donaldson, Esslemont.